Opera’s latest stats show continued growth in use of the mobile web in Africa. The top 10 countries using the Opera Mini browser are Nigeria, South Africa, Kenya, Ghana, Sudan, Zimbabwe, Tanzania, Ethiopia, Zambia and Morocco. The most popular sites in Africa include Facebook, Google, YouTube, Yahoo and Wikipedia. 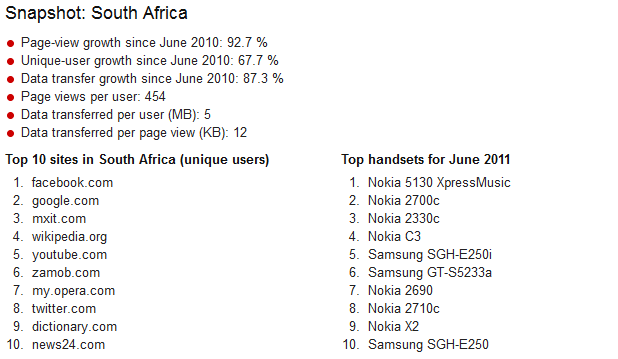 Interestingly, twitter comes in at 8th most popular site in South Africa. 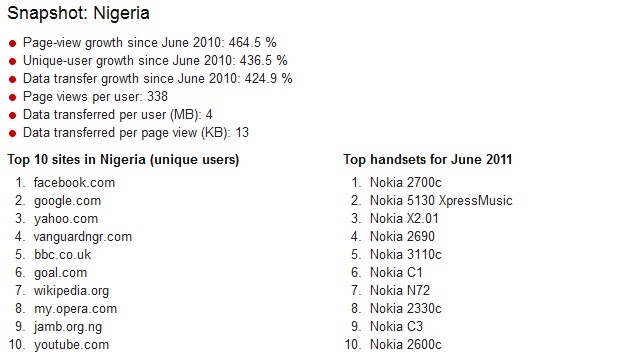 The top 10 handsets used were Nokia (outright winner), Samsung, Sony Ericsson, Alcatel, Apple and LG. Here are snapshots from Nigeria (top growth) and South Africa (second in line).